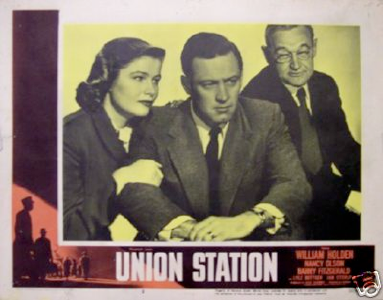 Looking at Rudolph Mate’s Union Station–starring William Holden, Nancy Olson and Barry Fitzgerald–is a useful counterpoint to the two movies recently reviewed here, The Naked City and The Tattooed Stranger. That earlier pair of noir films show the influence that Italian neorealism had on their directors–both were not only set in New York City, but mainly shot there as well. They have a gritty authenticity about them. Union Station on the other hand is a classic studio movie–set supposedly in Chicago’s train station, it was actually filmed in its entirety in Los Angeles, with LA’s Union Station standing in for its counterpart of the same name in the Windy City. A scene set in Chicago’s world famous Union Stockyards is actually shot in the much less known stockyards in Los Angeles. In and of itself, there’s nothing wrong with this–not all movies, especially film noir, had the budgets to be shot on location. One problem is that it’s never quite apparent why the film has to be set in Chicago rather than in Los Angeles (a feature unique to Chicago does have an important, though not irreplaceable, part in the film). Certainly, setting the movie in LA itself would have allowed Mate and his cinematographer to focus more on the architectural beauty of the Los Angeles station, instead of having to hide it behind fake latticework to evoke its Chicago sister station; of course, aesthetics probably wasn’t foremost on the producer’s mind in making this film. The choice as to location, though, is especially unfortunate in light of the fact that both Holden and Olson were coming off their star performances in Sunset Boulevard, one of the truly great film noir, and one that brings a taste of classic Hollywood home to the viewer. This is not to say that the movie isn’t good–just the opposite, it’s a first rate, highly entertaining film. The movie opens with Joyce Wittecombe (Olson) taking the train home to Chicago from her employer’s summer home; while steaming through the countryside, she sees a car racing the train, stopping at a rural station just as the train arrives. Two men jump out of the car, and board the train separately, sitting apart from one another on the same Pullman coach; Joyce’s suspicions are further raised when she notices one of them carrying a gun. Back in Chicago, the head of station security, Detective Lieutenant Calhoun (Holden), is sent to interview Joyce when her train arrives in the city. After following the men and retrieving a valise left by them in a station locker, Calhoun realizes that Lorna Murchison–the blind daughter of Wittecombe’s employer has been kidnapped. Sure enough, a ransom demand is soon sent to the father, and this brings Chicago Police Department Detective Donnelly (Fitzgerald) onto the case as well. On a side note, it’s never clear why the FBI isn’t brought in on a case that not only falls under its jurisdiction (kidnapping) and that involves a substantial ransom demand ($100,000). The kidnapper was clever in one regard–he decided to use the station as the hub for his contact with Murcheson, as well as the place where the money drop will take place. In such a large area, with tens of thousands of people passing through every day, the kidnapper figures, no one will be able to trace his steps. Unfortunately, he was very stupid in another regard (aside from committing the crime in the first place)–he has surrounded himself with a bunch of third string, small time hoods; they seem like they’d barely be able to run a three card monty scam, let alone a kidnapping. The other thing that the crooks didn’t count on was the skill and tenacity of both the station and city police (Bill Holden was a star–they weren’t about to make his character an idiot). The cops blanket the station as unobtrusively as possible; the half-witted crew hired by the kidnapper are rolled up one by one. The first is pursued on the El trains to the stockyard, where during a shootout, he manages to scare some cattle into stampeding and is crushed in the onslaught–it’s one of the most unique ways to die in a film noir that this reviewer has ever seen. The second crook is picked up by the cops in the station (thanks to some independent detective work by Joyce), and the cops work him over for information. This scene, and another later with Detective Donnelly confronting a boarding house landlord, looks like it belongs in a modern-day noir, rather than one made in 1950s. After using what the Bush administration might call “enhanced interrogation methods” on the crook, Calhoun and his men take him to the train shed, and hang him over the rail in the path of an oncoming express train. The small time crook sings, naming Joe Beacon (Lyle Bettger) as the kidnapper. These cops aren’t the clean-cut lawmen that you see in The Naked City or even The Tattooed Stranger. They’re more than a little willing to do what it takes to get the info they need, and are a little closer to the characters you’d see in L.A. Confidential. Soon, Calhoun and Donnelly, with Joyce almost always in tow, are after Beacon and his girlfriend as they move the kidnapped girl around the city. The final drop is scheduled for the train station, and from there it’s a race to see whether Calhoun and company can both find the kidnapper and save the life of Lorna Murcheson. All and all, Union Station is an exciting, well paced noir with above average performances from the leads, Holden and Olson, as well as members of the supporting cast, including Fitzgerald and Allene Roberts as the kidnapped girl. It’s also interesting, since the bulk of the movie, at least two thirds and nearly all of the important scenes, occur in the same place–the train station, or its immediate environs; you could almost picture it as a stage drama. At the same time, the hustle and bustle of the station gives the movie a sense of constant movement and energy that make it a highly entertaining film. The underground tunnels that play an important role in the film actually existed in Chicago–they were a subterranean freight railway system operated by the Chicago Tunnel Company. Originally built to house telephone and telegraph wires, a narrow-gauge railway was installed to bring coal and other supplies to buildings around the city. In 1992, construction workers driving a bridge piling in the Chicago River accidently breached the tunnel network, causing millions of gallons of water to inundate the basements of buildings throughout the Loop; the event became known as the Chicago Flood.